Well, color me surprised twice this weekend. Taylor Swift just won Record of the Year, which doesn’t really upset me… but really? I enjoyed it, but that’s it. But to be fair with the Grammy, the album was the biggest selling hit last year… and to an industry that’s struggling with physical album sales, that’s possibly a LOT. I wasn’t really supporting any particular artist this year, as I kept my year listening to Asian music. However, I really respect Lady Gaga’s live performance, despite my not really enjoying her albums. As for Swift’s performance, she picked a bad day to sound bad. However, she wasn’t the only one with a weak performance. Right after a very strong beginning by theatrical queen Lady Gaga with some piano by queen Elton John, and pretty good performance by Beyonce — I mean, that Alanis cover did give her some extra points — the show pretty much went on the average road. Moreover, the Grammy Awards have proved that there’s no Michael Jackson tribute without Janet. I must admit that Celine, Jennifer Hudson, Carrie Underwood and Usher sounded vocally great, but the performance was nothing but lacking as a performance. Add to that pimping the performance as a 3D act, which wasn’t really 3D for viewers, but for people there — which prompted a 3d-glasses-wearing Beyonce, and others included Rhianna — but I doubt all the people there had 3D glasses at hand. I wasn’t a big fan of Green Day’s 21st Century album, but the performance was okay-ish, since I do like musicals. However, I doubt old school GD fans appreciated it. And there was too much Bon Jovi. MTV owned Grammy’s MJ tribute, but MJ’s kids were kinda cute. Music in the west was weak overall. What happened to MTV Unplugged anyway? It feels like it just went away. I do remember Alicia Keys and Maroon 5 had MTV Unplugged albums, right? Or was it only Keys? 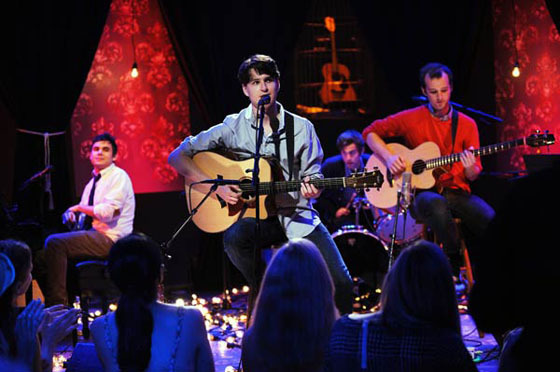 Anyway, Vampire Weekend on MTV Unplugged. Does that mean they’re famous? I thought only famous… like household names had MTV Unplugged albums. I really liked Vampire Weekend’s debut, and their sound translates well on this unplugged scenario. But what’s missing? I guess I’m used to really different arrangements. As it it now, they just sound kind of the same. Check out some clips (6 songs is a full show?) over at the MTV website. * seems like the embedding didn’t work for me. On July, I posted this about the Daria DVD. It sounds as though, rather than put the episodes out season-by-season, they are looking to put the whole series out at once, including the movies. There will be goodies, though which ones, I am not sure. However, the Sarcastathons and the specials were mentioned, and it looks as though they are going through ANY footage to find superfluous Daria appearances (like on TV talk shows). The commercial bumpers will be preserved, and in their rightful places. The episodes will be from the original masters, so no Noggin jujitsu cuts. The DVDs could come out as early as spring 2010. I’m going to play it conservative and still claim that they won’t be available until late 2010. For outside of the United States, it will be closer to 2011. Also, apparently… for licensing reasons — there will be music replacement. However, it appears that they will replace some songs with covers, so they are trying to make changes not too noticeable. As for licensing explanations, old shows that used music prominently are having issues with their DVD release because the permits they used on the original TV broadcast don’t apply when releasing the music on DVD. New shows don’t suffer from it, because the different licensing issues are dealt when shooting the show. via TVShowsOnDVD and DVDAria Petition.